Yellow Leaves Hill 3 is the last track of the Yellow Leaves Hill area, as well as the final track of the Star Cup in the horse racing sport of Mario Sports Superstars. 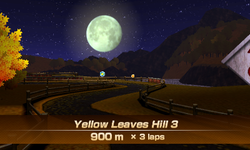 This track takes place in a different time of the day compared to the rest of the tracks in the game, taking place at night, marked with a large full moon. 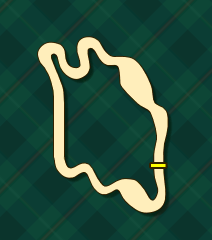 This course's length is 900m, with the length being tied with Green Farm 1, Green Farm 3, and Yellow Leaves Hill 1. This track additionally combines elements from Yellow Leaves Hill 1 and Yellow Leaves Hill 2, featuring large piles of leaves that players need to jump on wooden platforms to traverse, twisting, curving paths, as well as featuring split paths and many trees. Players first race straight until they turn left. Here, they have the option of crossing a bridge, which cuts through the track. At the wider portion of the track, players need to traverse through raised platforms through leaves; these leaves act as offroad and slow players down when traveled across. There are three options: players can choose to collect stars on the far left or right portion of the track, while the middle of the track has a cluster of stars, but it cuts through the offroad areas of the track. Players then traverse through a curving twisting road, with stars to collect and hedges to jump over. Past the snaking road, players travel in a straight line south, where they can take stars in the center or take carrots on the right; this road has many trees scattered that slow players down when touched, as well as having some hedges to jump over. Past the second curving area in the southern portion of the track, players traverse through another wide area, this time with items being on the sides and dash panels and trees in the center. Past this is a hairpin curve, which leads to the finish line. Starting out on the track. The first curving portion of the track. On the straight portion of the track, just before the trees. The last area of the track, with trees and dash panels strewn about. This page was last edited on September 10, 2018, at 22:19.